Spring game update: Ohio State football’s 2018 spring game is still on. But pending the weather forecast for the weekend the game-time could be changed, or cancelled. 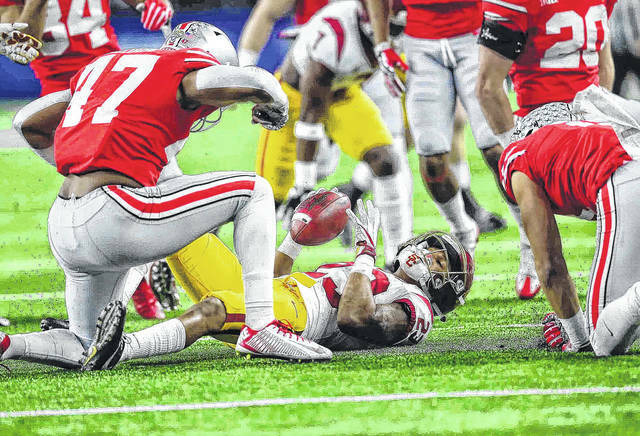 The Buckeyes issued a statement Thursday saying they would keep an eye on the forecast for Saturday before making a final: “Ohio State is evaluating the weather forecast for Saturday and will be making a final decision on the 2018 LiFE Sports Spring Game at a later time,” the statement stated. COLUMBUS — Many college football players have had their careers cut short by a series of injuries, but Ohio State linebacker Justin Hilliard might be one of the exceptions. The fourth-year junior is having what linebackers coach Bill Davis calls “a great spring” and possibly is playing his way into more time on the field in the fall after losing his freshman season in 2015 to a torn meniscus, missing all but the first three games in 2016 because of a torn bicep and sitting out spring practice in 2016 because of a bicep tear in his other arm. Hilliard was the only 5-star recruit in Ohio State’s 2015 recruiting class, so the expectations — including his own — were that the Cincinnati St. Xavier graduate’s highlights by this point would have significantly exceeded the 14 tackles he got last fall in his only healthy college season. With starter Tuf Borland out of action for spring practice and possibly into the season with an Achilles tendon injury, Hilliard and sophomore Baron Browning, also a 5-star recruit, are the top two middle linebackers heading into OSU’s spring game on April 14. “It means so much just because I know what I’ve been through. Just pushing through that, some of the difficulties mentally and physically, it means a lot to be out here this spring,” Hilliard said. Hilliard’s story is similar to senior wide receiver Johnnie Dixon, a former 4-star recruit who caught eight touchdown passes last season after having none in the rest of his injury-plagued career. “He’s such an inspiration. We talk all the time about that. Most of the springs I’ve been here I’ve been in the rehab room with Johnnie,” Hilliard said. If Borland’s injury keeps him out of action into the regular season Ohio State will have three new starters at linebacker. Jerome Baker declared for the NFL draft after three years in Columbus and Chris Worley was a senior, leaving the two other positions open. Despite the new starters and Borland’s injury, head coach Urban Meyer is positive about the linebackers. “I kind of like that position right now,” he said during a press conference on Monday. Davis said there is depth at linebacker even without last year’s starters. He said juniors Malik Harrison and Keandre Jones, sophomore Pete Werner, early enrollee freshman Dallas Gant and Browning are competing for playing time at Baker and Worley’s former positions. “We have a six or seven man competition going on that really is a tribute to the recruiting we’ve done here and the guys we have. We have a lot of positions that are up for grabs,” he said. He also isn’t ruling out a quicker than expected return by Borland. “We were so excited about the way Tuf finished the year and then he had an unfortunate accident or injury. We really do believe we’ll have him back for next season. Knowing Tuf Borland, he’ll be back sooner than most people would be back,” Davis said.